EXO Books is the pen name and publishing company of a writer from NYC, USA, Earth. Captain Lincoln's last day is the hardest day of his life. 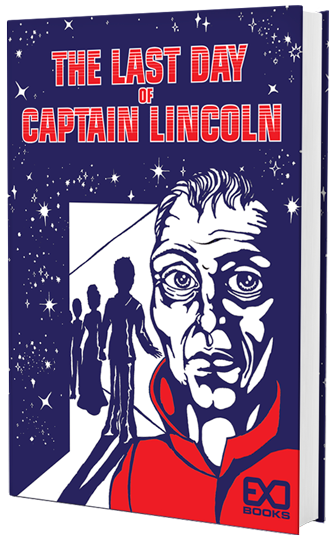 An old, onetime Captain of the interstellar spaceship USNAS Hope Eternal, Lincoln always knew that this day would come. For just as birthdays are carefully planned, so are deaths. And although he must reckon with his fate, this is not a somber story. It is a tale of love and sacrifice, told in the context of the most advanced civilization ever to exist--a society that has taken to the stars in an effort to save all that is best in humanity. Includes 11 superb, full page color illustrations plus B&W illustrations. A contemporary satirical take on Rudolph the Red Nosed Reindeer, Schmuck the Buck introduces Larry, a young Jewish reindeer. He overcomes his awkward and sometimes painful youth to save Christmas. His tale of acceptance and inclusion is sure to warm the hearts of anyone who loves Christmas, Hanukkah, or both. Sixty pages of vibrant illustrations by Karina Shor bring his story to life. A unique modern addition to any holiday library.